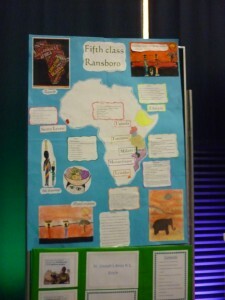 Children in 5th class Ransboro did a project on the theme “A better future for all the worlds’ children.” We worked in groups of two, each group selecting a country that Irish Aid assists. We thought about, talked through and researched the particular country of our choice. We examined the eight millennium development goals in detail. We paid particular attention to goals which combat poverty in the developing world, aim for universal primary education for all children, gender equity in education and combating diseases. We researched the impact and progress made in relation to these goals in our chosen country. We explored the history, the physical features, food, agriculture, lifestyle, culture, education, diseases, animals, music and art of our country of choice. Most children compared and contrased a day in our life here in Ransboro with our African counterpart. We made maps, comparison tables, graphs, puzzles, board games, jigsaws, word searches and acrostic poems. Using the internet we created tagxedos, photo galleries and we did most of our research online. In art we made African oil pastel drawings, chalk pastel creations, ink drawings and montages. We partook in a national debate and we challenged the motion that “charity begins at home.” We feel that to look after our own family and country is our responsibility, it is not charity. Charity is reaching out to the poorest people in our world. We compiled a cd where our motion was presented. We were delighted to learn that we came in the top 15 in our region. We were presented with a plaque in the Model Nyland Centre Sligo with the other 14 schools on 19th May. There was an exhibition of the highlights of the projects and this a photo of our project.